Florida Students Anti-Gun Rally Spreads - Integration Through Media ....! 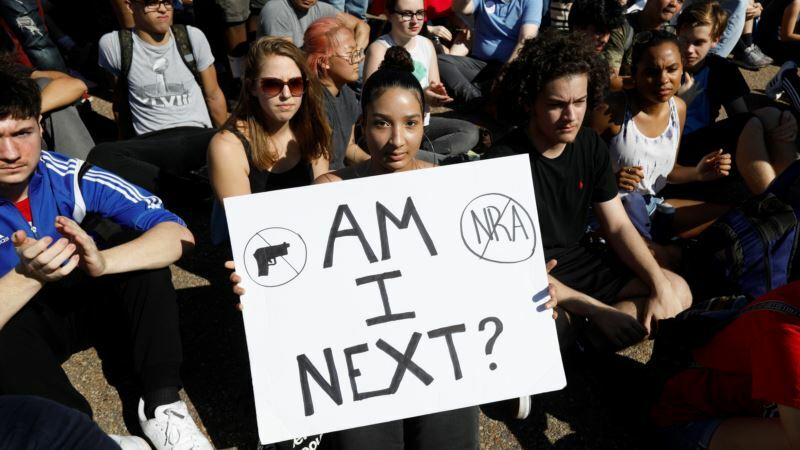 (VOA): Hundreds of students from Marjory Stoneman Douglas High School in Parkland, Florida, rallied Wednesday at the Florida Capitol in Tallahassee to pressure lawmakers to approve tougher gun control laws one week after one of the most deadly U.S. school shootings. Live: President Trump's listening session with students and teachers ​ A gunman killed 17 people at the Parkland school, triggering a wave of protests by students in Tallahassee and elsewhere in the U.S. Teachers and Florida state representative Sean Shaw joined the students on the grounds of the capitol, where the Democratic lawmaker criticized a state House vote Tuesday along party lines against a bill to ban assault weapons. The vote drew the ire of student shooting survivor Florence Yared, who directed her comments to lawmakers who voted against the measure. "Your children might become victims, too," Yared said. "You have the power to change this, and if you don’t we will change you! We will vote you out," she said emphatically to cheers and applause. Student survivor Ryan Deitsch told the Tallahassee crowd, "The more [the lawmakers] don’t act, the more they don’t deserve to be in office. I can vote, and I know who I am not voting for!" In Photos: High School Students Protest in Tallahassee The mass shooting also has sparked a wave of rallies elsewhere in Florida and in other areas of the country in an attempt force local and national leaders take action to prevent such attacks. Mothers from across Georgia converged Wednesday on the state capitol of Atlanta to attend a Moms Demand Action advocacy group rally. The rally's purpose is to advocate for responsible gun ownership and not to ban guns. More than 200 students at Montgomery Blair High School in the Washington suburb of Silver Spring, Maryland, walked out of school Wednesday to attend a planned protest for gun control at the U.S. Capitol. Protest organizers said students from two other suburban Maryland high schools, Richard Montgomery and Bethesda-Chevy Chase, also are participating in the demonstration. And in Washington, hundreds of high school students rallied in front of the White House, chanting, “No more silence, end gun violence.” They held their hands in the air during 17 seconds of silence in observance of the victims. The Stoneman Douglas students began taking buses over the past couple of days to Tallahassee to take part in Wednesday's rally and to meet with legislative leaders. "We [students] are the ones most involved in this," student Ariana Ortega told VOA before boarding one of the buses. "We are the ones who lived through this whole tragic experience, and we are going to be the future leaders of America." Students were in the gallery of the Florida House on Tuesday as lawmakers rejected a Democratic proposal to consider a bill to ban assault rifles. Republicans accused the Democrats of forcing the issue after 19-year-old Nikolas Cruz allegedly used an AR-15 to carry out the Stoneman Douglas shooting. Lizzie Eaton, a junior at Stoneman Douglas, called the legislature's vote "heartbreaking." But she said: "We're not going to stop. We're going to keep fighting for what we believe in. We're not going to let this bring us down." In addition to Wednesday's rally in Tallahassee, President Donald Trump will host parents, teachers, and students for what the White House calls a "listening session" on school safety. Survivors from the Parkland, Sandy Hook, and Columbine school massacres have been invited. Students are also planning a March 24 rally in Washington and other major cities called "March for Our Lives." Music stars Justin Bieber, Lady Gaga and Cher have thrown their support behind the march. Actor George Clooney and his wife, Amal, a human rights attorney, said they are donating $500,000 to help pay for it, and media mogul Oprah Winfrey said she would match their contribution. "Our family will be there on March 24 to stand side by side with this incredible generation of young people from all over the country," Clooney said. A Washington Post-ABC News poll released Monday said 86 percent of respondents who identified themselves as Democrats said stricter gun control laws could have prevented the Florida shooting, while 67 percent of Republicans said stricter laws could not have prevented the massacre. More than three-quarters of both groups, however, said more effective mental health screening and treatment could have prevented the attack. Overall, 77 percent of respondents said Congress is not doing enough to prevent mass shootings in the United States, while 62 percent said Trump was not doing enough. Police say shooting suspect Nikolas Cruz confessed to gunning down 14 students and three adults at the high school he was expelled from last year. He was able to buy an AR-15 rifle to carry out the mayhem after clearing a background check. In Washington, Democratic lawmakers often call for tighter controls on gun purchases, while Republicans often oppose them, saying they would violate the Second Amendment to the U.S. Constitution sanctioning gun ownership.